When it comes to looking after our hair extensions, we know how tricky it can be, as well as remembering what has to be taken into consideration, after all they do need that extra TLC compared to our natural hair. Even thinking about brushing our hair has now become something we don’t do on autopilot, and is something we have to take into account when brushing our extensions and bonds/wefts. So is your current hairbrush ok to be brushing through hair extensions and their bonds? Chances are it isn’t, because it hasn’t been designed for that purpose. Do Normal Hair Brushes Have An Effect On The Longevity Of My Hair Extensions? Actually yes, they do have an effect. Some have bristles that are too hard, others cause the hair extensions to become static, some are too rough and others damage the bonds and wefts where your hair extensions attach to your natural hair. And this is why we designed our very own specialist Hair Extension Brush. Our hair extension brush has been made with a dual bristle design, including boar hair to not only provide the best hair brushing experiencing for you, but to care for your hair extensions and their bonds too. This brush has been specifically designed for use with hair extensions, taking into account every little detail, whilst also taking into account the delicate need and care for natural hair also. The Hairapeutix brush helps you create whatever style you want with your hair extensions and thanks to its dual bristle technology, it won’t pull on your bonds and cause your hair extensions to become loose, which is something other brushes aren’t able to do. The brush will be able to provide you with soft and smooth hair to help reduce frizziness and to easily get tangles out of the hair whilst keeping the cuticle of your hair extensions flowing in the right direction. The dual bristle technology includes both boar bristles and round head bristles for the ultimum hair brushing experience. What do the two bristle heads do? Round head bristles are perfect for styling and gently removing knots, whereas the boar bristles work best at detangling long and thick hair, providing the right amount of pressure for the perfect everyday care of your hair and hair extensions. 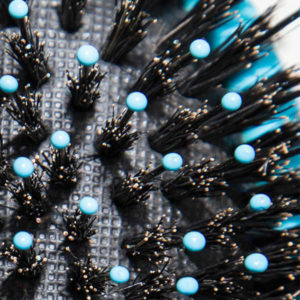 The Hairapeutix brush can be used on both wet and dry hair extensions to ease out knots. As we know it’s strongly advised to not brush hair extensions when they are wet, however hair extensions need to be gently brushed when they are wet to stop any further damage from knots which can affect their longevity. It’s easier to brush out tangles when the hair is wet than when it is dry, leaving open the opportunity for the extensions to become matted. When brushing your hair extensions whether wet or dry, always do so from the bottom upwards. This will avoid you pulling at your hair extensions and will get the tangles out more easily. For more information on how to brush your hair extensions and dry them check out our handy guides, for helpful tips and tricks. The Hairapeutix hair brush can not only be used on a daily basis and to detangle hair when wet, but it can also be used to help style your hair when drying or straightening for instance. It really is a versatile brush that has multiple uses for all your day to day hair needs. 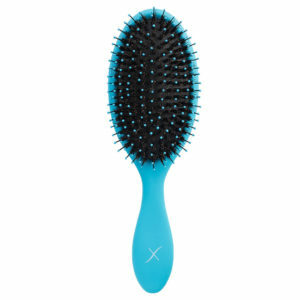 Check out the NEW Hairapeutix Brush now and welcome into your life your new hair must have! Our full range of products have been specifically designed with hair extensions in mind.